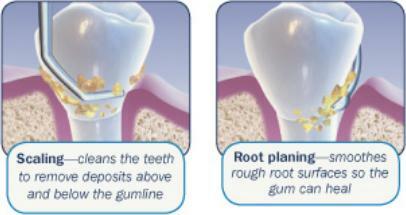 The appointment length for Periodontal Scaling and Root Planing is generally an hour per quadrant. If only isolated areas of a quadrant are to be treated more than one area may possibly be treated in that time period. It is best to have anesthesia in the area to help keep the patient comfortable during the procedure. This can be done with a local anesthetic (similar as to when a tooth is filled), or a topical application with a product that is inserted into the periodontal pocket. This will be discussed with each person as the the specific need.